In this review, we’ll take a look at how this straight needle compares to key features you need to consider when buying bamboo knitting needles and straight single points, such as sizes and lengths. We’ll also look at how the Clover Takumi bamboo single point needle compares to similar products. 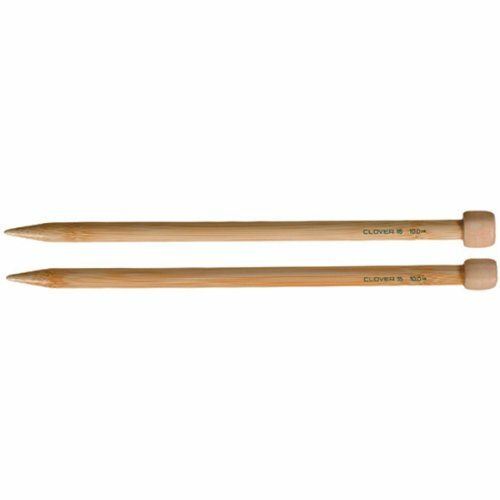 Beginning knitters will appreciate Clover’s Takumi bamboo straight knitting needles for delivering a surface that helps stitches stay on needles while maintaining tension. An added bonus of these needles: they’re long lasting without breaking the bank. Experienced knitters will appreciate the lightweight warmth and feel of these needles and the reliability that comes with Clover’s reputation as a bamboo knitting needle manufacturer. Clover’s takumi (Japanese for artisan) needles provide knitters with straight bamboo knitting needles in a variety of lengths and sizes. In the smallest varieties, bamboo grows a few millimeters per day, while the largest varieties average 30 cm or 1 foot per day, with some varieties growing as tall as 40 meters or about 130 feet. This perennial grass has a long history of uses in Asia. Hollow on the inside, the dense outer layer of fiber makes the best bamboo knitting needles. Clover selects bamboo grown in Japan for their bamboo knitting needles. Clover manufacturers knitting needles on specially designed equipment using the dense, less porous, outer layers of the bamboo, which makes a stronger knitting needle. Harvesting bamboo in the winter assures Clover provides knitters with a better product – less water means denser fibers. 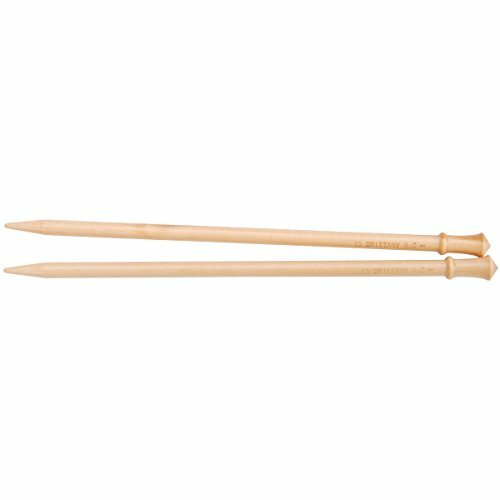 Durable but lightweight, bamboo knitting needles remain a favorite of knitters worldwide. 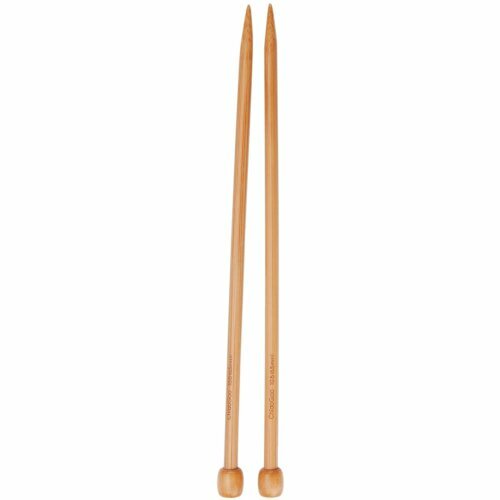 A renewable resource, eco-friendly and natural, bamboo knitting needles feel warm in your hands, which is an added bonus when knitting for long hours or when your hands feel a bit sore. Typically 9-14 inches in length, straight bamboo knitting needles are measured from the tip to the stop at the opposite end. Knitters find the two lengths 9 and 14 offered by Clover just right for flat knitting. If you knit with your needles tucked close to your body, even the longest Takumi goes wherever you go. If you tend to knit with your needles outstretched like wings, think twice before knitting with the longest Takumi while seated next to other passengers in confined spaces like planes or trains. An important consideration when looking for a good bamboo knitting needle is the tip. The Takumi brand from Clover gives knitters two needle tip styles – pointed and round. You’ll find a more pointed tip on smaller sized needles while larger sized needles have blunt tips. Cobweb and lace knitters may find that even at the smaller sizes the tips could be sharper, but most yarns work well with these needles. The rounded tips work equally well with yarns that typically split such as cotton. Sized US 0 – 15, Takumi bamboo needles provide variety to the most discerning knitter. Made from the same dense outer layer of bamboo and to the same exacting standards, each size of Takumi needles works as hard as the next. Smaller sized bamboo needles may not take tension as well as metal needles so care should be taken when using bamboo that stitch tension is appropriate for the needle size. Bamboo works best with slippery yarns such as silk or cotton because of bamboo’s natural tendency to catch yarns. Beginning knitters like bamboo for its sticking ability, which means fewer dropped stitches. Additionally, beginners feel more in control of the yarn and stitches because they choose when to slide a stitch rather than it slipping on its own from the needle. Yarns, where the dye was not properly set, may discolor your bamboo needles. Although it doesn’t affect the needles ability to work, the discoloration will remain. Although bamboo’s stitch stickiness may slow down experienced knitters, they appreciate the long-lasting properties of bamboo knitting needles. Larger sized bamboo needles can last a lifetime, but care must be taken when using smaller sized needles as they can break more easily. Compact dense outer layers of bamboo make Takumi bamboo needles a solid choice for long-lasting durability. Knitters get hooked on using bamboo needles. For many, they like the way bamboo feels – warm and smooth. For others, they like that bamboo bends just a bit, which keeps their hands from tiring too quickly. Don’t like the metallic clicking sound made by metal needles? Then try bamboo needles – they naturally absorb sound instead of reverberating it. The needles come polished from the Clover factory. Over time, the natural oils from animal fibers and from the knitters’ hands keep the patina on the needles. Clover’s Takumi bamboo needles light coloring help knitters easily see stitches when working with dark colored yarns. These lightweight needles offer a similar performance, warmth, and appearance. While they can help beginners keep stitches on their needles, they can have a higher tendency to warp and break than the Clover brand. Knitters looks for a little more speed will appreciate the gains they find in these aluminum single points. The ends are concave to help prevent dropped stitches, making it a great option all around. Another single point for knitters looking for speed, these needles are enjoyed by knitters of ages - children to grandparents. It's an especially great option if you're looking for a colorful needle. It's a lot like the Clover needle in terms of durability, look & feel, size, speed, environmentally friendly, and fewer dropped stitches. Whether you go with the Brittany or the Clover, might come down to which one you can find at a better price.